An unusually luxurious takouba hilt mounted in silver with contrasting copper trim reportedly characteristic of work from Agadez, Niger. 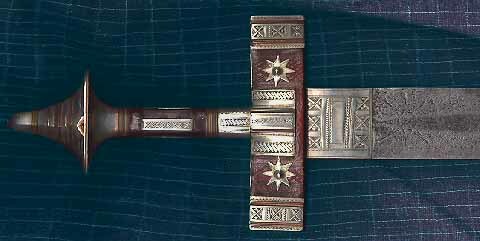 The condition of the leather and silver work on the hilt and scabbard (not shown) suggests that it is very recent work. As the blade shows evidence of age and use, it has likely been remounted. The takouba (takooba, takuba) is a style of sword traditionally associated with the Tuareg, a nomadic people predominantly of Berber origin showing varying degrees of Negroid cultural and biological influences among the different clans. The Tuareg long dominated the central and west-central areas of the Sahara desert (including portions of what is now Niger, Mali, Burkina Faso, Algeria, Libya, Mauritania, and Morocco) and had a reputation as effective warriors and as highwaymen, exacting heavy tolls from trans-Saharan caravans for over a millennium. Having broad, straight, double-edged blades averaging 74 to 84 cm. 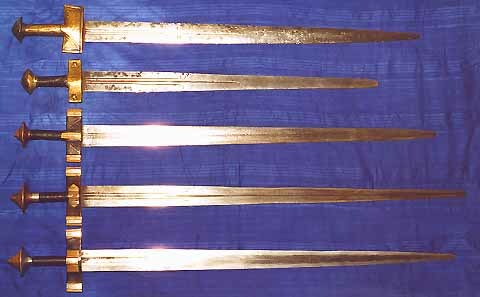 (29 to 33 inches) in length and a simple cross-guard, the takouba, like the more westerly Sudanese kaskara, has long been confused with medieval European swords. Current learned opinion is that these swords are a distinct and entirely indigenous African type, although speculations of possible influence from Spain via the Almoravides in the 11th Century (Nicolaisen (1997, p. 399)) or from medieval Arab broadswords (Spring (1993, p. 42)) have been made. European blades, dating as early as the 16th Century, have been identified in typical takouba mountings and are documented by Briggs (1965), who also presents evidence for a significant Saharan trade in such blades from the 16th Century until the early 19th Century. Briggs (1965) also notes that many blades of European form and with European style markings are known to have been made locally in the Sudan (the broad savannah region south of the Saharan desert) and Sahara as late as the mid-20th Century. The vast majority of the takoubas which the modern collector is likely to encounter are entirely of African workmanship. The typical blade tapers, especially distally, to a rounded point. The edges may be irregular from repeated sharpening, especially toward the tip. The method of sharpening leaves a roughly striated appearance on the flats of the blades adjacent to the edges, 0.5 to 1 cm. in width; the area within 20 to 30 cm. of the hilt is often not sharpened. The remainder of the blade usually has a roughened, mottled and pitted appearance. While corrosion over a long period of time might create such a pattern, in many instances, it appears more likely to be a surface left from incomplete finishing after forging. Indeed, the usual narrow central fullers (grooves) running parallel to the length of the blade from the hilt often appear to be ground, having striations, and sometimes do not show the degree of pitting and irregularities otherwise characterizing the rest of the surface. The typical blade will have three such fullers, the central being longer than those on either side. Other patterns, too numerous to include, will also be seen, such as a variation with five short narrow fullers. Examples with a single short, wide fuller (a quarter to a third of blade width) beginning at or within a few centimeters of the hilt will also be encountered; a blade style frequently encountered in kaskaras. Typical blade markings will be discussed with the examples. A group of more typical takoubas; the two above [A] [B] being of the "southern" type and the three below [C] [D] [E] of the "central" type. Detailed zoom views of each sword may be viewed by clicking over the appropriate part of this image, or the numbers in brackets. Briggs (1965) describes two forms of hilt: a "southern" form having a wide guard covered in brass and a thick pommel with a rounded upper contour (as in the upper two swords above) and a "central" type having a leather covered guard and a flat pommel with a stacked pyramidal tip made up of alternating brass and copper (as in the lower three swords above). A representative scabbard is shown and described with the details on the bottom sword [E] above. There is considerable disagreement in the literature as to whether the takouba was historically limited to the Ihaggaren (the Tuareg aristocratic warrior class) or whether it was carried into battle by noble and vassal alike (Nicolaisen (1997, pp 589, 595) and Spring (1993, p. 28, 30)). Today, Spring (1993, p. 30) notes that the takouba has been adopted for wear by prosperous men of numerous ethnic groups in Sudanic Africa. The smiths, ineden, who make and mount these swords are predominantly of Negroid Sudanic African ancestry, and form a separate caste which has its own secret language ténet. Members of the blacksmith caste do not intermarry with the Tuaregs and are often regarded as possessing dark mystic powers (Nicolaisen (1997, pp 57 - 61)). Briggs, Lloyd Cabot, "European Blades in Tuareg Swords and Daggers," The Journal of the Arms & Armour Society [U.K.] Vol. V. No. 2. (1965), p. 37 - 92. Nicolaisen, Johannes and Nicolaisen, Ida., The Pastoral Tuareg: Ecology, Culture, and Society (New York: Thames and Hudson, 1997). Spring, Christopher, African Arms and Armour, (London: British Museum Press, 1993). Spring, Christopher, "African Hilt Weapons," in Swords and Hilt Weapons (New York: Weidenfeld & Nicolson, 1989) p. 204 - 217.